Early Humans Ardipithecus and Australopithecus - HISTORY'S HISTORIESYou are history. We are the future. The Old Stone Age people were hunter-gatherers. That is, they roamed the area where they lived gathering wild plants and, often, hunting animals for food. Most often, they moved with the seasons in search of food. We know about these people because scientists have found fossils and artifacts that reveal traces of their life. Fossils are the preserved remains of early life, while artifacts are human-made objects. What are two differences between apes and early humans? Human-like hominids first appeared around four million years ago! Hominids are marked by their ability to walk upright and their bipedalism. Hominids include extinct ancestral primate mammals, as well as recent humans. Since the first hominids arose on the plains of east Africa, we humans have gone through a lot of different stages to evolve into the people we are today! Scientists discovered Lucy's 3.2 million year old bones in the Great Rift Valley in Ethiopia. About this same time in history, around 4 million years ago, the higher primates, including apes and early humans, first appeared. There was a difference between the apes and humans. Human-like hominids could stand upright. Apes could not. Their hands were different, too. Ape hands were made for climbing and clinging. Early human hands were jointed differently, which allowed them to not only use tools, but to make tools. No one knows if they actually made tools, but artifacts have been found in South Africa that suggest they might have made simple digging tools from bone! Artifacts are the remains of things that are made by humans. Common artifacts include tools, pottery, and decorative objects such as jewelry and statues. The human diet at this time was mostly vegetarian, along with some meat that was probably obtained by scavenging. You might wonder how we know anything about hominids that lived 4 million years ago! How do we know they even existed Lucy told us! Lucy! : In 1974, a group of scientists discovered a set of fossils in Africa. 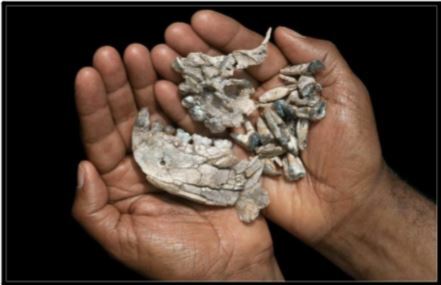 Fossils are the remains of living things - plants, animals, and humans - not things that are made. In this case, the fossils were a skeleton. The bones were those of a young female, approximately 20 years old when she died. After listening to the Beatles' song, "Lucy in the Sky with Diamonds," the scientists named this "young lady" Lucy. About 3 million years ago, when Lucy was alive, she was rather short - less than 4 feet tall - and probably weighed about 50 pounds. To the right, Lucy stands between a chimpanzee and a modern human, showing her relative size. Her brain was about the size of an orange. Although she still had the ability to climb trees easily, her bones showed she probably walked erect. There were no signs of broken bones or teeth marks that might show why she died. Because of that, scientists think that she probably fell into a lake or a river and drowned. What are at least two reasons that bipedalism was important to human development? Our New Oldest Cousin - Ardi: In 2009, scientists identified a distant cousin of Lucy's and named her Ardi, which is short for Ardipithecus Ramidus. Ardi was also discovered in Ethiopia, just 40 miles from the site where scientists found Lucy in 1974. Like Lucy, Ardi was a hominid. Ardi, however, is 4.4 million years old, over 1 million years older than Lucy! The story of human history continues to evolve, and Ardi tells us even more about the distant human past. From Ardi's teeth, scientists have confirmed that the area where Ardi lived was a vast woodland and that Ardi's diet consisted of mostly fruits and vegetation gathered from the trees where she spent much of her time. While the long fingers of her hands and the divergent big toes of her feet indicate her ability to grasp branches and move freely in her tree-top dwelling, her pelvis demonstrates that Ardi was also capable of bipedalism. That means that she could walk on two feet, though she probably did so for only short stretches at a time. By looking at the wear-patterns and chemical make up of Ardi's teeth, scientists can tell that she lived on a diet of fruits and vegetation. While bipedalism at first exposed our early ancestors to predators, it also gave them the advantage of increased mobility, and that had at least two important advantages. First, when food ran short, the ability to move quickly on two feet allowed Lucy and even Ardi to move where food was more plentiful. Secondly, increased mobility meant that our early ancestors could choose from among more potential mates. The ability to move about led to different patterns of social behavior and, as social patterns changed, cooperation ultimately allowed our early ancestors to migrate to distant parts of the globe. It's amazing how much can be found out from a few old bones. Scientists - and students of history - are like detectives who try to put pieces of a puzzle together in order to tell a story. They can tell a great deal from a skeleton, whether it's one year old, 3 million years old, like Lucy, or nearly 4 and a half million years old like Ardi! Activity: For this lesson's activity, click the button below and complete the first two rows of the Early Humans Comparison Chart.